With over 30 years of experience and one of Nova Scotia's largest and most comprehensive fine picture frame selections, you are certain to receive the professional care and attention your treasures deserve. 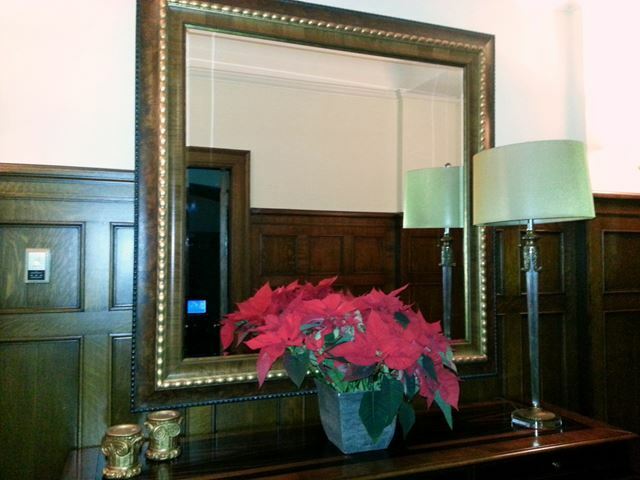 The Perfect Corner offers true custom picture framing, done onsite by professional picture framers. To ensure the long life of your artwork, we only use archival methods and materials in the form of rag mats, backing and glazing options for unsurpassed preservation of your fine art and collectables. This way your keepsakes can be passed on to those you cherish. You'll find hundreds of frame options to suit your design and budget. An endless selection of mat colors and textures are also available so you'll find exactly what you are looking for in our Wolfville Studio. 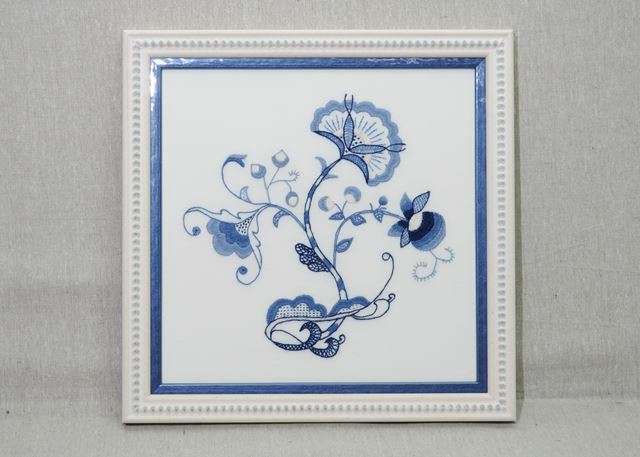 We stock the finest quality frames and mouldings from Roma, Larson-Juhl, Fotiou and Nielsen. 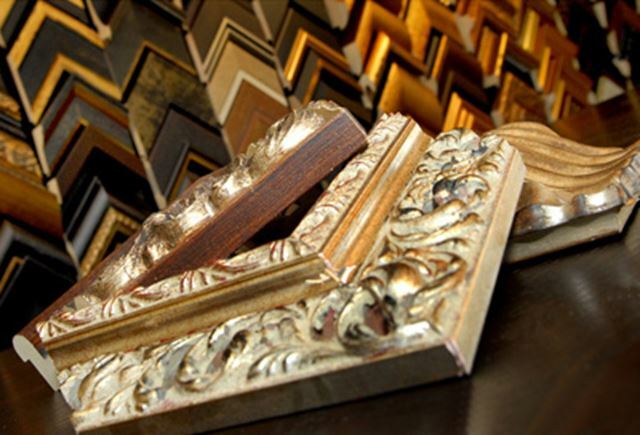 Whether you desire hand crafted replicas of antique frames or forest friendly options, we carry them all. The process starts with a no-obligation design consultation, where we will help you select from a range of choices to suit both your artwork and your décor. No appointments are necessary. We will advise you on colors and textures for the framed piece and proper methods and techniques for long term preservation of your artwork or other treasures. Our goal is to not only beautifully and creatively present your artwork and memories, but to help them last a lifetime by using conservation grade materials and mounting techniques. After the design consultation, we will set about framing your work. Our workshop features state-of-the-art picture framing equipment including a Fletcher mat cutter, pneumatic double miter saw for clean cuts, and a French Cassese joiner for precision corners. Unlike “big box” stores, your artwork and memorabilia never leave our shop. More often than not, the person who designs your piece will be framing it as well, and if not, they will be able to communicate directly with the framer to make sure the design is executed properly. Other shops may call their work custom, but few offer the full design-to-build process onsite like The Perfect Corner Custom Framing. This allows us to complete most jobs in a week or two. We also stock several frame styles for jobs that need to be completed the same day. Whether the project is a humble treasure or a priceless piece of art you can be certain that we will use the finest materials and procedures to protect your artwork. We've framed and preserved everything from hundred-year-old masterpieces, christening gowns, records, and even an axe! Our rule of thumb is that if you can get it through the front door we can frame it. If you can't, let us know and we will come to you. Let us know about your next project. Whether it's a full-fledged art show, that poster in the closet you've been meaning to frame, a recent inheritance that needs updating, or a gift for someone special, we can help. We can't wait to see what you bring though the door next! Mirrors are more than just a useful everyday appliance that only help with personal grooming or perfecting an outfit. Besides the functional aspect, mirrors take an underestimated, central position in every room and house, an opportunity which is unfortunately too often left aside by simply putting up the blank glass plate itself or with a generic, trivial frame. Just as a mirror reflects your physical image, it is also a reflection of your home. And this is where the question and choice for the right frame become an eminent aspect in enhancing your home. The primary responsibility of the picture framer is to preserve and enhance your work of art. The goal of the picture framer is that these works of art will be protected from damage for as long as possible, and that the framing process will be reversible so that the works of art can be restored to the same condition in which they were presented to the framer. In addition to this conservation responsibility, the framer must create an environment for the work of art which presents it in a visually interesting and pleasing manner. The Perfect Corner staff is trained in conservation framing practices and we use only the finest archival materials. Whether we are framing works of art on paper, paintings on canvas or other supports, or objects of value, we use careful conservation techniques for securing the artwork in a manner that is safe and completely reversible. We have many glazing options available to either reduce reflections and/or to protect artworks from ultraviolet light. Because of the danger of harsh lighting, we recommend that you fight fading of your artwork with conservation quality glazing. Visit The Perfect Corner and our helpful, well trained staff will show you how to protect your artwork with the finest conservation materials available. The style of a frame should always flatter the art it surrounds. If the art you want to use isn’t the same style as your room, that’s okay. We can help you choose a frame that will serve as a bridge between the different styles. For example, an ornate frame may work well with abstract art to help it work in a classic space or a fresh look for traditional art can be achieved when paired with a soft contemporary frame style, instantly updating it. Relate to the color temperature of the art. 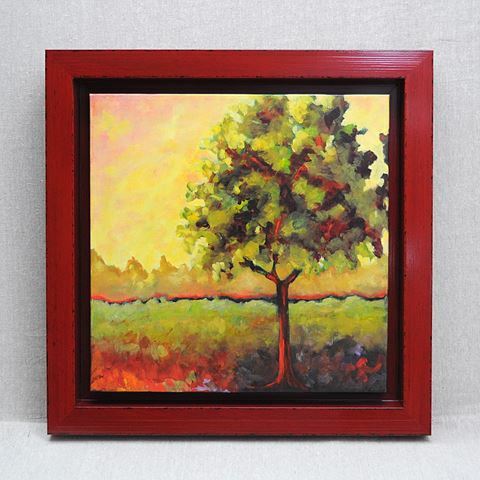 Red, orange and yellow are warm colors so they coordinate with gold or wood tone frames. Blue, green and purple are cool colors and they relate more to silver or gray frames. For historical pieces, we often suggest using the finish color that would have been originally used when the piece was new. Our deeper mouldings are used to create shadowboxes when we are framing objects. However, the same mouldings can provide great solutions when framing art on paper, too. When the art is placed forward in the frame, the added depth projects the art towards you. If the art will hang in a niche or bookcase, a deeper frame helps offset those recesses. We can also recess the art into the deeper frame, adding depth and drama. For centuries it has been a common practice to combine more than one frame moulding to make a single frame. This technique is called stacking, just like when carpenters stack mouldings when putting finishing touches on a room. 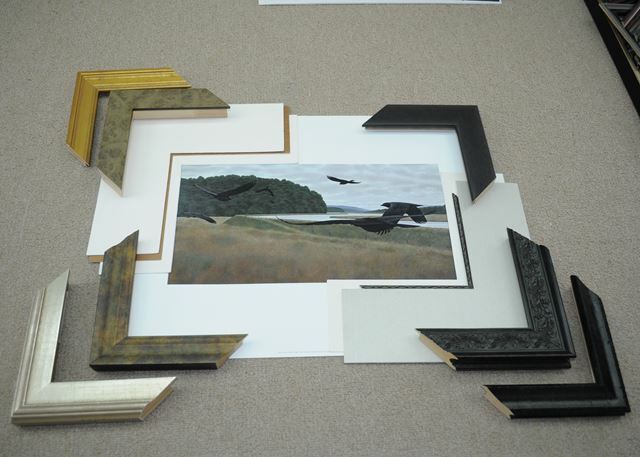 Stacking frame mouldings enables us to mix colors or styles to coordinate with your art. This technique also helps us provide you with a frame of a grander scale for a large or special piece. A fillet is a decorative accessory that can be inserted into the opening of a mat or the lip of a frame. When used with a mat, it is most common to choose a fillet that coordinates with the color and style of the frame. However, when you want to add a fillet inside a frame, contrast is most desirable. Fillets are available in a wide variety of colors, styles, and widths for all of your framing needs. We are always happy to show you our collection. A mat is more than a pretty color! Traditionally matting serves a twofold purpose – the first, and most recognizable, is the visual effect. A properly designed mat can enhance and even improve the beauty of the artwork. The second (and less obvious) reason for matting is to preserve works of art or photographs on paper. A mat provides the proper depth for airspace between the artwork and the glazing. This is important because temperature shifts can cause moisture to condense on glass, which can then cause mold, fungus, rippling or sticking of framed items to the glass! A mat also serves the function of isolating the artwork from environmental contaminants that can leach in from the edge of the frame. The best mat boards are cotton or high alpha cellulose, archival, lignin and acid-free boards. Don’t settle for inferior wood pulp (also known as paper) matboards! They can damage your art or collectibles by off gassing acid as they age, causing fading and yellowing. High quality matting provides the best support for framed objects by protecting and enhancing it. Not only will proper matting help to protect and preserve your art, it will set the mood for the finished piece. major differences to consider, such as reflectiveness, clarity, weight, and UV protection. It is thinner than window glass, which makes it lighter. This is so that the completed picture frame is not excessively heavy. It is pre-cleaned from the factory, so there is no powdery residue on it. Picture glass is checked for flaws, such as scratches, roller marks, inclusions, and bubbles. Glass that doesn’t meet our exacting standards will not be used for picture framing. It is iron reduced, so it doesn’t look as green as plain window glass. Now for the different types of finishes! Non-glare: An etched glass, not treated to block ultraviolet light. Non-glare glass doesn’t reflect like regular glass, but because of the etching can mute colors and blur detail if there is too much space between it and the art it covers. Naturally filters about 45% of UV light. Conservation Clear: Similar in appearance to Regular glass, this is a clear glass with a special coating on one side designed to filter 98% of harmful UV light. This is the most economic choice, while still maintaining conservation quality. Conservation Non-glare: Similar in appearance to Non-glare glass, this is an etched glass with a special coating on one side designed to filter 98% of harmful UV light. Non-glare finishes appear softly etched and muted. Good where reflection control is necessary, and a diffused appearance is desirable, non-glare glass isn’t appropriate for frames with substantial depth. Museum: When nothing but the best will do, Museum glass is anti-reflective and filters 98% of harmful UV light. This glass is the clearest and least reflective glass we offer. It is “water white”, meaning that the iron has been reduced to eliminate the greenish cast from other types of glass. Beautiful! 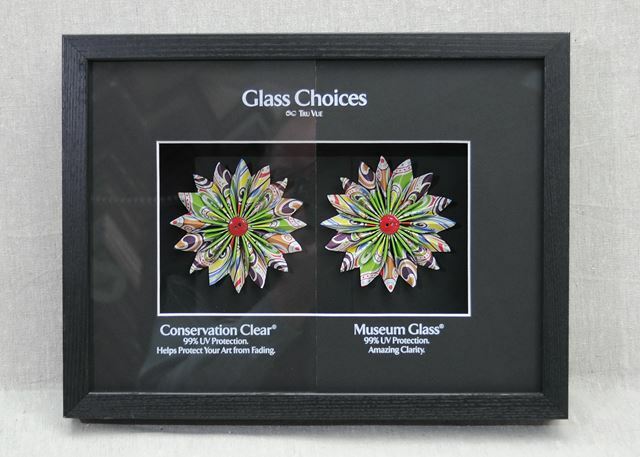 Acrylic: We use acrylic in framing when a shatter-proof glazing is called for. It also is lighter than any type of glass, so if weight is a concern, acrylic glazing is the appropriate choice. We only use the best grade of acrylic in our framing applications. It has the appearance of glass, is non-yellowing, and doesn’t scratch easily. Available in Regular, Non-Glare, and Anti-reflective finishes. Glazing as a part of Conservation Framing: If the item you are framing has sentimental or monetary value of any kind, or if you just don’t want to see it fade over time, we strongly recommend using conservation glass as a part of its preservation! Along with proper matting, backing, and handling, UV filtering glass is integral to the longevity of your framed artwork, heirloom or collectible. Want to preserve and protect the signed jersey, photo, hockey stick, or baseball bat of your favorite athlete? Or maybe your special athlete plays in Little League? Either way, we can help! 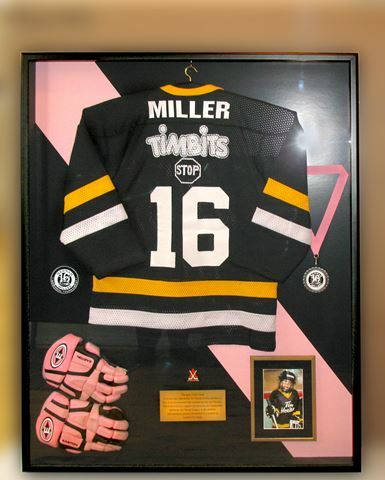 We can frame your sports memorabilia to give it the best presentation possible, while protecting it for years to come. Our designers will create a framing solution that captures the spirit of the sport and celebrates the team. Objects such as photos, patches and pins help complete the story. From a simple jersey, to a collection of NFL pins, we will create an exciting and personalized display that you will be proud to hang on your wall. Take your treasured articles out of the drawer or box and let our skilled designers turn your jumble of memories into a story. 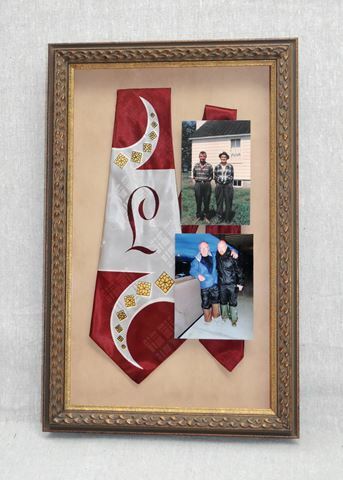 Show off and preserve your special mementos in a shadowbox frame. 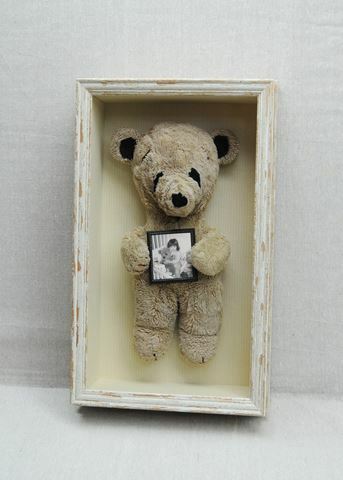 Shadowboxes can be made to accommodate anything from mom’s wedding ring, a treasured teddy bear or even an original Blenkhorn Axe complete with photos and wood chips! The Perfect Corner recommends shadow box frames and displays for all collectible items such as sport objects, collectors plates, diplomas and tassels, clothing, and other memorabilia. The idea of shadowbox framing is to create a tableau which both displays and preserves your treasured items. The objects remain in pristine condition, to be admired and enjoyed for years to come. Bring your treasures out of hiding, and enjoy them every day in a shadowbox frame made by The Perfect Corner. We have a wide selection of stretcher bar moulding in various depths on-hand. For example: 1/2 inches – 3 inches are popular depths of stretcher bar used. If you are requiring something different, we would be happy to build you a stretcher frame to your specific needs. We can also accommodate any size of stretcher frame you might want. From miniature to 8ft x 10ft stretcher frames and even larger; we can customize any size you want. Primed and un-primed blank canvas. Re-stretching painted canvas onto a different depth of frame. ie) If the current stretcher frame is too deep for the frame you would like to fit it into. Tightening up of an older canvas, or textile artworks. Photographic and Gicleé images printed on canvas. Please Note: We take great care in handling works that may need to be re-stretched. It is possible that the age and condition of your painting may limit us in what we are able to do. Before starting your order, we will consult and advise you on the best way deal with the piece at hand. You put a lot of care and hours into your needlework. It deserves to be framed beautifully for all to enjoy, and a well-framed needlepoint starts with the stretching of the fabric itself. We stretch your needlework over acid free foam core board, lined with cotton rag mat board, and pinned into place. If desired we can lace your needlework as well. Either method helps to flatten the needlework in preparation for matting and/or framing. Proper stretching can be done without having to use chemicals or irons to flatten the work, and should be completely reversible so the needlepoint is not harmed by the stretching technique. Rug Hooking is stretched the same way but with a layer of quilt batting underneath to give loft to the finished artwork. Thanks Mary Ann for the lovely frames you have done for me. You have a talent for choosing styles and colour. All the pieces you have done for me have turned out beautiful. I appreciate your taste and style, I highly recommend your work.